Gosh, I am loving that new Rogue card - really clears a lot of blunders and struggles for my kind of Rogue deck. Are you guys hyped for the Mythos? 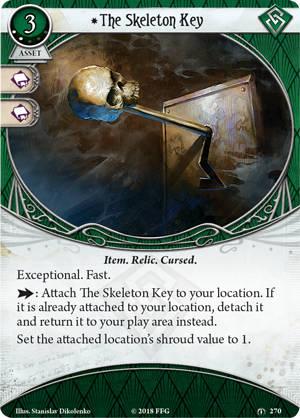 I'm wondering if other Investigators can take the key from its attached location, as others will also be able to interact with it when its on a location, and whether it would return to its original owner, or we'll have a player card that can be passed around during a game? Yeah. It's not worded that way. Looks like anyone can grab it. There's no test to do either of its action options. Also, it's a Relic Lvl 0-4, so Ursula can add it to her deck. Skeleton Key plus Lantern is going to be pretty awesome - unlimited investigation where only the auto-fail can prevent you succeeding. Pretty action-intensive to keep attaching and detaching the key but hey. It's also really nice on Ursula - she can move to a high-shroud location, attach the key so that the less intellectual investigators can easily handle it, then move over to another location and work on that herself. It also works really well with Archaic Glyphs (Guiding Stones). Other investigators can't pick the key back up, because they don't own the key so can't activate its effects. This is why Shortcut (2) is worded to change the text on the location it's attached to, since other investigators can activate text on locations. However, I think it'll be the source of a lot of FAQ requests - assuming that you retain ownership of the asset while it's attached to the location, can you activate it from another location? Nothing in the rules about what happens there. I'm going to make a pre-emptive rules request now, I think. You can only activate a player card if it's in play and under your control (RR, "Activate Action"). So no, another player cannot activate the action required to pick it up. Helping with weaknesses and treacheries is different because they are encounter cards. And Shortcut(2) is different because it adds an ability to the location. You also get a Willpower pip and a fifth charge. assuming that you retain ownership of the asset while it's attached to the location, can you activate it from another location? Nothing in the rules about what happens there.﻿ I'm going to make a pre-emptive rules request now, I think. The ability to pick it up is only available "If it is already attached to your location". I'm not talking about that ability. If you're at another location, what's to stop you activating the "attach to your current location" ability and sidestepping the need to pick it up at all? The intent of the card design is clearly that you need to pick it up and take it to a new location, but the rules don't necessarily support that yet. CSerpent has already talked about it, but also the card says "Return" it to your play area - which means other people cannot activate it - the key didn't come from their play area after all, and thus cannot be returned to their area. The "bold arrow" actions can only be triggered when it is "within reach", i.e. in your play area, at your location, etc. If not, then you would be activating all kinds of "bold arrow" from another location - using the special supply in FA, or investigating the Man in Mask in PtC, which is obivously not a good thing if this is valid. Oh, I see. You're right, the rule is just "a card in play and under his or her control", nothing about location. The "Activate Action" rule specifies that scenario cards have to be at your location. It does not for cards under your control. That's the intention, but there's nothing to that effect in the rules. Indeed, there's nothing at all about whether a player card is under your control at all once attached to a location. Ahh, I get where you guys are going now. I guess this really needs clarification - probably they will add in a rule that says bold arrow action can only be activated while you are there, regardless of card types; or something along those lines. Skeleton Key will also make double or nothing pretty great on investigate actions that include deduction or Rex etc. Sure, Rex can't take the key because it's not lvl 0, but he can take double or nothing and investigate at a skeleton key location for a likely whopping 4 clues.. and that's if he doesn't commit anything to get even extra clues. I'd argue it's worth taking on literally any rogue because even if you're not going to investigate (skids), someone surely will. It's also incredibly useful when you have to perform an investigate action to, say, find a path to Where Doom Awaits! My question is since skeleton key sets the shroud TO 1, what happens if there is an obscuring fog? Is it set to 1 and then given +2? Or is it give +2 and then set to 1? There's probably a rule for this, but I wouldn't presume to know it. Edit: Ignore the comment about Rex for multiple reasons, but the usefulness of double or nothing on anyone carrying the key still stands. Use it on someone using Rite of Seeking at one of these locations for instance. I was wondering this too. It's the location's shroud value, so I read it as the number on the circle becomes 1, and any modifiers are applied to the 1. Like an investigator's base skill value. I hadn't considered flashlight, but yes, that would be an example as well. I'm not sure to be honest. It read to me like it should fall in line similar to RGM (even though they're affecting different card types) which would set the base value to 1 and then modify that... but that's not what the card actually says. It just says set the shroud value to 1, which might explain why the Skeleton Key has the 'cursed' attribute? Rex will only get 3 with Double or Nothing - his ability is a reaction trigger, not a result of the successful test. Not sure about the "set to", but I believe it would override any modifiers. I don't think we've ever seen the phrase "base shroud" though. The shroud is a property of a location, and that's what is being set; modifiers are in addition to whatever the location's shroud is. I thought this too. I think the difference may simply be that "base values" are only a thing in terms of stats. Shroud is not a stat and also a test (hence base agility value vs modified agility value). Technically the test is an intelligence test against the shroud value. I'm having a tough time putting this into words, but it sort of makes sense to me as to why the terminology may differ. I think it's uncharted territory, rule-wise. My gut, though, is that is the Key was already on a location and I drew Obscuring Fog, I wouldn't get to ignore the Fog. I guess I'm just looking for a more thematic reason as to why the key is 'cursed' as well. The other Cursed cards are the Cthonian Stone, the Decorated Skull, and Calvin. Not all of those things have a drawback. A skeleton key seems like just a skeleton key. I mean, it's clearly not just a skeleton key because it works literally anywhere, but it's not a specifically named key either (like the Silver Key). Anyway, I think I've talked entirely at too much length about this card already, hahaha (I blame my pre-4th of July beers). I'm unsure how specific the trait keywords are going to be at determining how a card is used. I'd like to see a list of logic behind traited player cards and why they are banded together as a particular type. Insights are often related to card draw or clue-ing but also include barricade, for instance, providing a particular mechanical function, but relics (which are always assets) have a wide variety of functions. Are there intentional undertones and how developed are they for each trait? so... does it make a difference if the Key is attached to your current location and you draw Obscuring Fog, vs if you have Obscuring Fog attached to your location and then play the key? I would have to imagine these two scenarios would *have* to be ruled the same way. That leads me to believe the only possible ruling is that the shroud value is 1, can't be modified any further, it is 1.
edit: to elaborate a little. I say they would have to be ruled the same because the game state doesnt memorize order that cards are played in, so a board state of location+fog+key looks identical, regardless of the order.